How Much Does the SAT or ACT Really Matter? "At Alfred University when we evaluate academic preparedness of applicants, we look at the strength of schedule (Carnegie Units, AP, etc. ), high school GPA, class rank, and SAT scores. 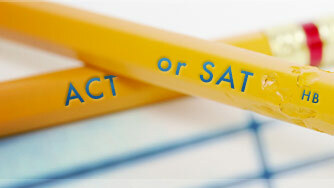 The SAT is just one measurement, and it is the least important of the four academic components. The other academic review measurements tell more about the applicant because they are built over three to four years, not a one-day performance that can be influenced by factors beyond the student's control." Most selective private colleges have holistic admissions--they evaluate the whole student, so strengths in one area can often make up for a perceived weakness in another area. Students who have a strong academic record show that they are capable of college-level work. As Mr. Unis demonstrates, most college admissions officers recognize that success in AP courses, an IB curriculum, Honors courses, and other college-preparatory coursework means much more than scores on a single test.